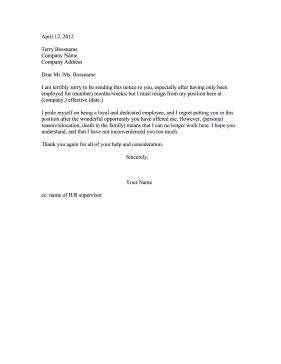 Written in an apologetic tone, this printable resignation letter apologizes for quitting after only a short time on the job. I pride myself on being a loyal and dedicated employee, and I regret putting you in this position after the wonderful opportunity you have offered me. However, (personal reason/relocation, death in the family) means that I can no longer work here. I hope you understand, and that I have not inconvenienced you too much. Thank you again for all of your help and consideration.